We want to be honest with you about root canal treatment: Not all dentists agree about whether it’s a good idea to have a root canal to save a tooth. 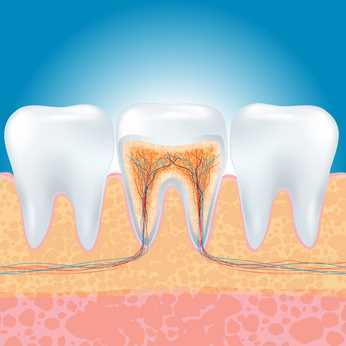 When there is tooth decay near the nerve, a root canal is sometimes the only way to save the tooth. When you have root canal treatment, the nerves, pulp and associated bacteria are removed and replaced with dental materials. The treatment restores natural function, but the tooth is essentially dead. And some of the materials inserted in place of the nerves and pulp are controversial. When you choose Dr. Paige Woods and Brighton Dental San Diego, we’ll help you make an informed decision about whether root canal therapy is right for you. • A root canal is serious relief for serious pain. After root canal therapy, you won’t be able to feel sensation in that tooth anymore – and that includes pain. • You get to keep the tooth. When a tooth problem is serious enough that you need a root canal, no other treatment option we have available will allow you to keep your natural tooth. • The integrity of the arch is preserved. Gaps between teeth can widen and the arch – or row arrangement of your teeth – can change significantly, causing alignment problems that get worse and worse over the years. • There’s an infection risk. Since the inside of the tooth has no blood supply, this is a strong risk. That’s why root canal therapy involves adding chemicals in place of the pulp of the tooth to reduce the chance of infection – but the possibility of infection isn’t eliminated. • A crown is often necessary. Having a lot of work done on a tooth means that it can easily lose its structural integrity, and crown is the only dental restoration method that can restore integrity to a heavily damaged tooth. • Root canals are not right if you have a compromised immune system. This is the case because of the serious risk of complications. • The most common rubber sealer is toxic. Used inside most root canal teeth, the most common product is toxic and can allow water to get in causing other issues. The toxic sealer used in most root canals is called gutta percha. Among its other problems is that it can break its seal near the bottom of the root canal, allowing infection inside the tooth. Also, the material doesn’t do a very good job filling smaller accessory canals within the tooth, and that can cause a world of problems as well. A better material is now available to use inside a root canal tooth, but it has problems of its own. Instead of automatically having a root canal when you have a badly damaged or infected tooth, consider alternatives – including a modern root canal with a better internal sealer or perhaps a bridge to cover the space where the bad tooth is removed. Dental implants are another popular choice at Brighton Dental here in San Diego. Dr. Woods can help you decide what treatment is best for you based on your situation, your concerns and your values. Learn more about Root Canal Treatment elsewhere on our website. And contact us to schedule an appointment. We have solutions other dentists may not have available to them, and we’ll take care of you.